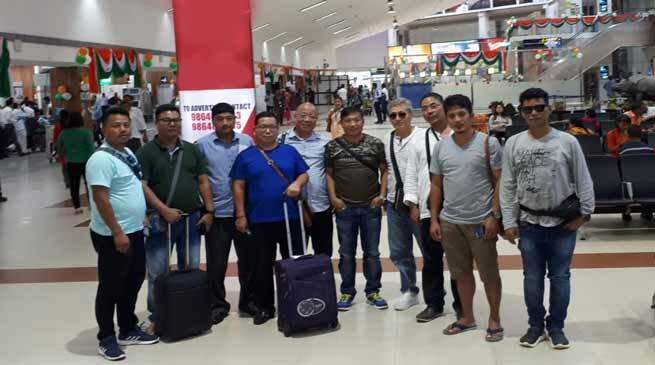 The 11 member officials team of Arunachal Olympic Association (AOA) today left for Jakarta the capital city of Indonesia to attend the Asian games-2018 there. Team leader, Arunachal Karate Association (AKA) President and AOA Treasurer Kyosi Likha Tara informed that it would be an exposure trip where the leaders from various sports organisation of state are leaving together in a team and will visit various games venues of Asian games -2018 in Indonesia and would be able to learn a lots. The team not only will witness the inauguration of the Asian Games- 2018. The team will learn so many things in this event which will be use full when we returned to own state.